W. W. Norton & Company, 9780393243932, 336pp. To public radio host and reporter Brady Carlson, the weighty responsibilities of being president never end. As Carlson sees it, the dead presidents (and the ways we remember them) tell us a great deal about ourselves, our history, and how we imagine our past and future. 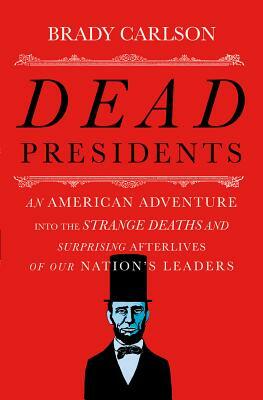 For American presidents, there is life after death--it's just a little weird. In Dead Presidents, Carlson takes readers on an epic trip to presidential gravesites, monuments, and memorials from sea to shining sea. With an engaging mix of history and contemporary reporting, Carlson recounts the surprising origin stories of the Washington Monument, Mount Rushmore, Grant's Tomb, and JFK's Eternal Flame. He explores whether William Henry Harrison really died of a cold, how the assassin's bullet may not have been what killed James A. Garfield, and why Zachary Taylor's remains were exhumed 140 years after he died. And he explains the strange afterlives of the presidents, including why "Hooverball" is still played in Iowa, why Millard Fillmore's final resting place is next to that of funk legend Rick James, why "Who's buried in Grant's Tomb?" became a running gag for Groucho Marx, why Ohio and Alaska fought for so long over the name of Mt. McKinley (now known as Denali), and why we exalt dead presidents not just with public statues and iconic paintings but with kitschy wax dummies, Halloween costumes, and bobblehead dolls.